In August a team of nine OCdts led by 2Lt Sam Potts RE set out on an ambitious expedition to climb Huascaran Sur 6746m – Peru’s highest mountain. In addition to AML’s Major John Tolan and Captain David Stanley, the team also hired two local UIAGM guides – William Cordero and Cesar Vargas for the duration of the mountain phases. We have worked with these guides on three previous successful 6000m+ expeditions. Prior to deployment, the team undertook winter skills training in Scotland under the supervision of Major Tolan. The expedition began to acclimatise with a trek along the Salkantay Trail, which crossed the Salkantay Pass at 4600m on the way to Macchu Picchu. This route concluded with a road move to the railway and a 10km final walk to Agua Calientes at the foot of Macchu Picchu. Here the team took in the sights of the Inca City and then returned to Cusco. The team then moved by bus north to Huaraz, a large town surrounded by the peaks of the Cordillera Blanca and Peru’s mountaineering capital. Having checked climbing conditions and reviewed the itinerary, the team switched their first peak from Pisco to Ishinca (5500m). This was a three day climb based at the Don Bosco Refugio. From the hut we set off at 4am walking on good trails to the glacier. Once on the glacier, the route was a gentle meander to the narrow summit which had a steep finish with some large crevasses under very fragile snow bridges. 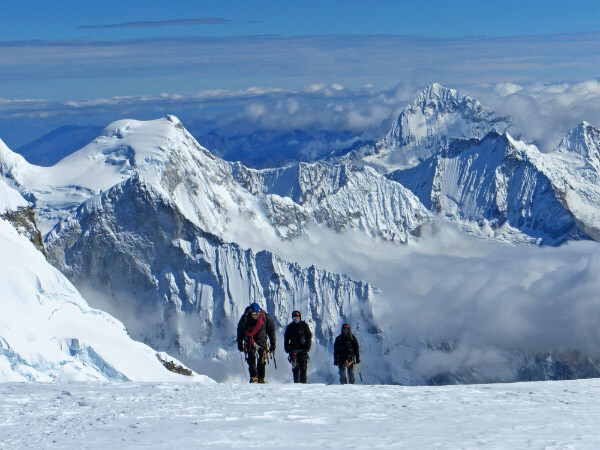 The team achieved 14 out of 15 members on the summit and were rewarded with spectacular views of the higher surrounding peaks. Elated at the success on Ishinca, we then focussed on Copa at 6189m – a huge mountain with a large glacier on its table like top. This was a four day climb using a base camp at 4500m and a high camp at 5300m. The route to base camp took about six hours on good paths with the camp being good with good pitches and a clean river. The route from base camp to Copa high camp looked improbable with a steep gully and headwall to climb. Setting off at 0730, the team followed good track well into the gully. As it steepened, the teams roped up and climbed quickly to avoid stone fall to the snow headwall. This consisted of a short snow/ice pitch, which the teams negotiated in good style. Thereafter, it was a gentle rising walk to the glacial plateaux and high camp. The team dug tent platforms in the snow and settled in for the night. An alpine start climbing through penitentes and a series of steep rising ramps, which the teams protected thus slowing progress. As the steepness eased, we followed a broad ridge leading simply to the summit, again with 14 out of 15 climbers on the summit. The views here were dominated by the Huascaran massif just a few kilometres away. In descent, extra care was taken and we arrived at high camp in the late afternoon. The team then returned to Huaraz to prepare for Huascaran. Huascaran is a huge massif with the North and South peaks separated by a large col called ’The Garganta’. The team plan went perfectly with a walk from Musho to the Don Bosco Huascaran Refugio taking about six hours. The next day was a complete rest day in the Refugio to aid acclimatisation. From the refuge, the team had an easy 3hr ascent to Camp 1 on the glacier at 5300m. The following day was a difficult climb through a steep and heavily crevassed section known as the ‘Canaletta’ to get to high camp at 5900m. After a few hours climbing and approaching high camp, we were approached by two Ecuadorean policemen seeking urgent medical attention for their Ecuadorean guide. He was some distance higher, so we steadily approached him to see him in the tent he had been placed in. He was very ill, incapable of standing, incoherent and panicking about his condition. Major Tolan taking his signs and symptoms found he had severe HAPE (High Altitude Pulmonary Oedema) and developing HACE (High Altitude Cerebral Oedema). His pulse was weak and he had an O2/SAT of 52% – against a team average of 80-85%. Fortunately, we had altitude drugs and after consultation with a medical handbook, he was treated with Nifedipine and Dexamethasone for the HAPE/HACE. After nearly an hour with him he was recovering and was well enough to be carried down the mountain by the policemen, our Peruvian guides and porters. This intervention undoubtedly saved the guide’s life. The team meanwhile set high camp and rested. After a good nights sleep the team set off at 2am for Huascaran. 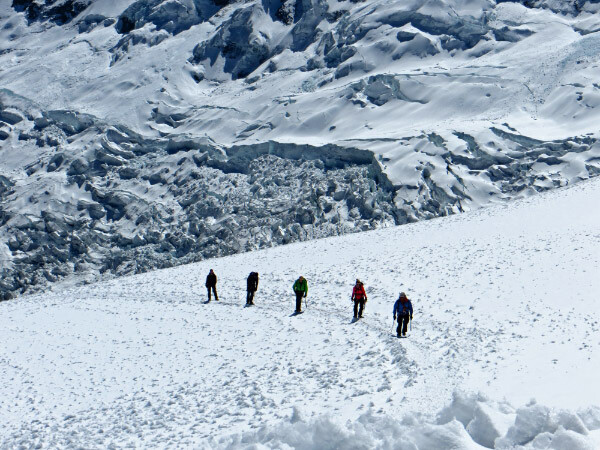 Initially, crossing the hugely crevassed Garganta and then the ascent of Huascaran Sur. The route here rises steeply through some steep ramps before easing as we neared the broad convex summit dome. This took longer than it appeared due to the many false summits. It is surprising how much harder the going was over 6000m, and reduced the team to a slow and breathless pace, eventually reached the summit after 7.5hrs climbing. 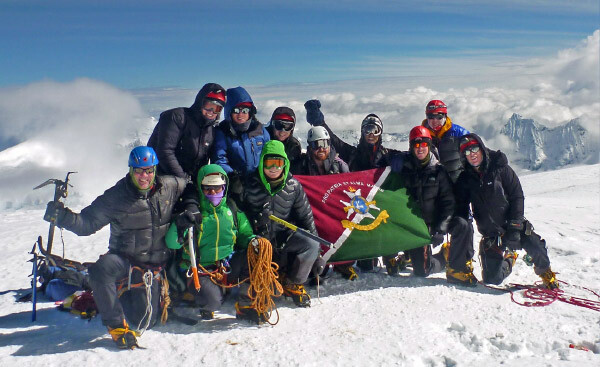 Here we saw 12 out of 15 on the summit of Peru’s highest mountain – a tremendous achievement. Conditions were perfect so we had a lengthy celebration / photo session. Having summited, the team made their way back to high camp, taking extra care and doubling up rope teams over the fragile snow bridges of the Garganta. In good shape and beaming, the team had an early meal and a well earned nights rest. Overnight, there had been a large snowfall so we set about a quick withdrawal back to the refuge.he going through the Canaletta was hard in the deep snow, one of our porters slipped and got a severe wound from the adze of his ice axe through his cheek. He was treated and dressed by Major Tolan and then evacuated for urgent medical treatment. Once through the Canaletta, the team made fast progress to the Refugio where we celebrated with a good meal. The return to Huaraz was straightforward and the team celebrated what has been an outstandingly successful expedition. 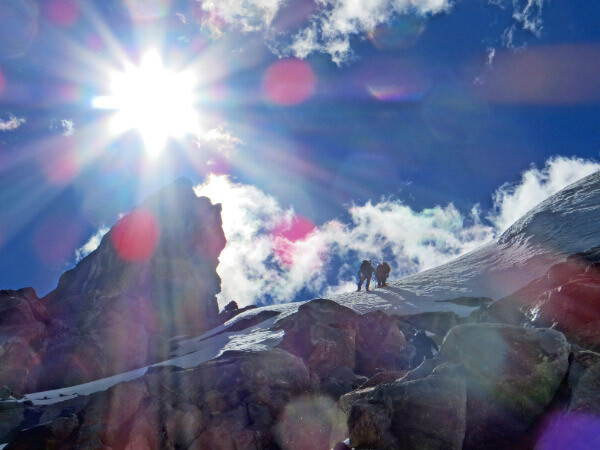 Every team member had climbed at least two of three high peaks and were in good health. 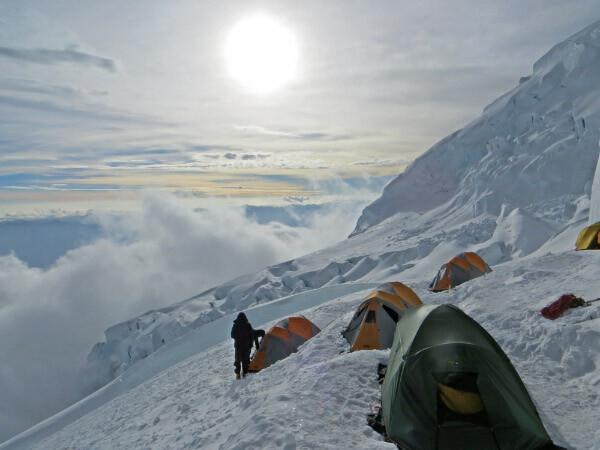 Peru is a great country for high altitude mountaineering with the logistics easy to set up. Huaraz has a very professional Casa De Guias with UIAGM qualified guides. The expedition could not have taken place without the excellent support of the Ulysses Trust, The AMA and Support Command. It enabled the team to fund our guides, get better quality accommodation and food which all led to the strong health and condition of the team and therefore such strong summit success.